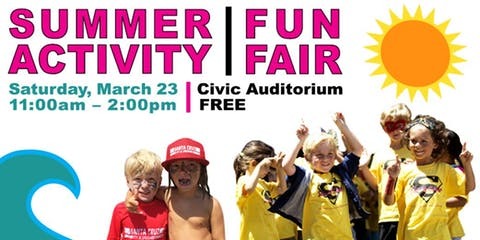 We invite you to explore many opportunities for summer enjoyment at our Parks and Rec Summer Activity Fun Fair at the Civic Auditorium this Saturday, March 23, from 11 a.m. to 2 p.m. The entire family can learn about our dozens of City summer programs and ask questions before summer registration opens on April 13. Meet summer camp leaders, junior guard and class instructors. Participate in hands-on activities for kids and adults. Play in our Pop-Up Park with bounce houses, games and food trucks. Snap your photo in our lifeguard lifestyle photo booth plus enter a chance to win fun prizes in our raffle. We’ll help you get your Parks and Rec account up-to-date and ready for “Super Saturday” registration for classes that range from swimming to ping pong to dryland surfing and dancing. Let Parks and Rec staff help you plan a fantastic summer for your family! Learn more at www.santacruzparksandrec.com or call 420-5270. This entry was posted in City Beat, Featured, Local Loop and tagged in city of santa cruz, family event, fun fair, parks and red, summer fun, summer programs. Bookmark the permalink.